Submitted by mahoney on Fri, 03/28/2008 - 10:27am. 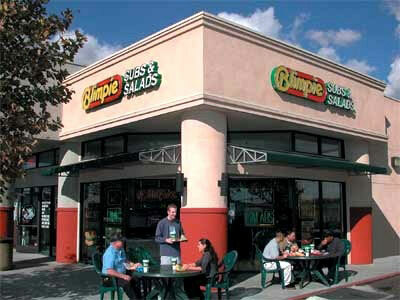 Blimpie subs and salads across the USA including Alaska and Hawaii...Blimpie is a fast-food submarine sandwich chain headquartered in Scottsdale, Arizona, and is the third largest sandwich chain in the United States, behind Subway and Quiznos. The company is owned by Kahala-Cold Stone Corp. Blimpie's first store opened in Hoboken, New Jersey, in 1964. (The original store called "Blimpie Base" remained unchanged until about 1994 when it was remodeled)...Three friends from St. Peter's Prep High School in Jersey City, NJ—Tony Conza, Peter DeCarlo and Angelo Baldassare—knew for a while they wanted to start a business together. After lunch at a sub shop in Point Pleasant, NJ, they decided this is what they would do. They settled on Hoboken, NJ, as the place to open their shop. After arranging financing and everything else they needed to open the shop, they finally opened on April 4, 1964, and by the end of the day, had rung up $295 in sales (sandwich prices back then were between 35 and 95 cents). Updated the file using the latest data from the Blimpie website locator.